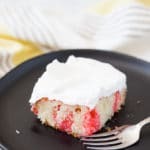 A refreshing 1970s classic dessert that's perfect for spring or summertime family get-togethers. Prepare the box of white cake mix following the instructions on the package, using a 9 x 13 inch cake pan. Let the cake cool for about 30 minutes, and then poke holes in the top of the cake using a fork or a toothpick. Pour the Jello mix into a medium bowl, and pour 1 cup of boiling water into the Jello. Stir until the Jello is dissolved. Pour the Jello over the cake, taking care to pour it into the holes you poked. Cover the cake pan with foil and refrigerate for at least 3 hours. Spread Cool Whip on top of the cake in an even layer. Slice and serve.